Soft & cozy. Jusy exactly what my sone wanted. He said that he feels like he is sleeping on silk. He also was olease with the fun sports design. 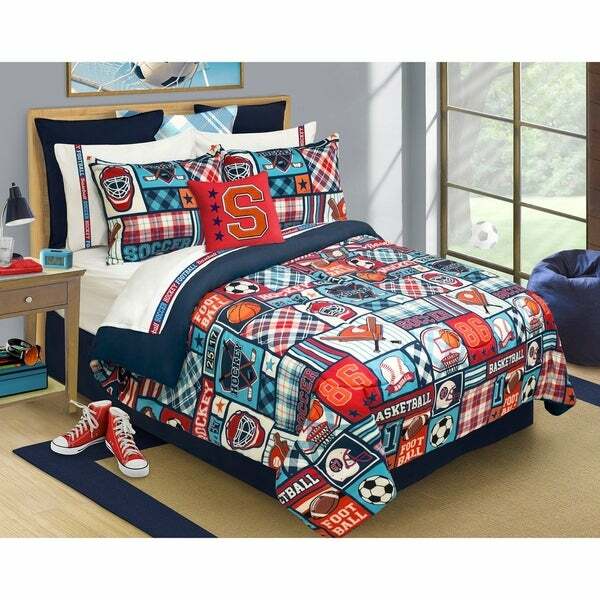 This Sports Centre Comforter Set is part of our newest designs from our Just Kidding collection. We make bedding fun and your child will love this exclusive design and the comforter is light, soft and warm and cozy. This comforter set is just as pictured. The colors are vibrant and my son loves all the different sports featured on material. Its a little on the thick side but it's the average quality of any other kid's comforters. It work in our favor because my son gets hot quickly. Purchased this comforter set for my 12 year old son. He likes it very much. Beautiful colors, good quality and value for the money. I ordered similar set for my younger son, but that order has been canceled by the seller. My grandson is really into soccer and he really likes this comforter. Its hard to find anything a teenager really likes so this was winner! looked good until washed. washed according to directions but the filling is now all bunches up. looks awful.